Choice of crystals. Be attentive at the purchase of crystal! One of important factors is a top (sharp and not removed), the best of all, that the verges of top and self edge did not have notch, jag and notches. In addition, than more transparent crystal, so much the better (except for quartzs- hairstone). This internal transparency is needed in order that your curative energy was cleanly passed through a crystal. 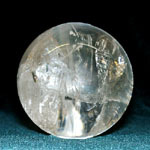 The choice of crystal takes a place intuitional. What colors do like you? What size do crystals befit you (little - for healing bodies, large - for meditation)? What crystals do you prefer, polished or saving the natural cutting? What sum are you ready to expend in the purchase of crystal? Then stretch a hand to the that crystal which will answer you. you will hold for some the time a hand above a crystal. If you will feel a shove or vibration above him is a sign that your power vibrations are ideally compatible. In each of us am both began: womanish and masculine. Womanish energy in a man allows him to show the senses, intuition. Masculine energy in a woman stimulates it to creation, activity. Often one or another energy is blocks. If you will carry a crystal on left of body, he will stimulate Yin - perceiving, emotional, listening part itself. 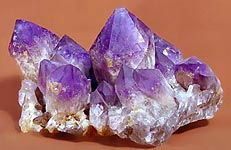 A crystal on a right side will activate large energy, confidence in itself, assertiveness, that ability to operate in accordance with our desires. In addition, if you want to understand to feel essence anything - carry a crystal on left, and if you need to speak out, carry him on the right. When you need to learn, study and memorize anything, hold a crystal in a left arm. you can do it without a crystal and will find out on your own his influence. 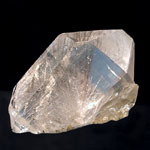 During meditation it is good to hold the crystal of quartz in a left arm. Take a deep breath, strain and weaken all of the muscles. Yet there is a method to tune in to the stone which will demand some persistence. A method is extremely simple. It is necessary to look at a stone until he will not leave off to be a stone. Consider him, feel deeply, feel. For the night lay him at a bed so that after awakening your look above all things met with him. Overcome internal resistance and then, when a stone will come back to life, start pulsate you will feel that magic force which is celled in a stone. you will be able to ask and get answers. It psychotechnics psychology exists at some Indian tribes, practicing magic. Take a crystal two hands. Bring him to the heart, look at him, breathe together with him, tune in to him. Then close eyes, softly touch by him the center of forehead, and will hold for some the time so two-three minutes. Not opening an eye, smooth motion put a crystal before itself or on knees. Weaken hands, and mentally look at a crystal, present him with all of his cracks. you will imagine that your consciousness is included in a crystal, and then endeavour to see and itself into him. Remain there so much time, how many want. When will feel in itself a willingness to go out from a crystal, do it smooth, gradually, slowly opening eyes. you will feel lightness, update whole-body. you will sit minutes five quiet. You remember, if you will be asked to take off a stone, to look him or try, a decoration must be laid on a table, that other man took him from a table, but not from hands. Since persons will be looked by a stone, he also must lay him on a table. Otherwise there is a danger "infected" his negative vibrations. For storage it is better to use dense and ight-tight sacs for every stone separately. A sac must be silk or from a cotton. In such packing semiprecious stone can be kept in one small box or box. A famous scientist and philosopher Pythagoras taught that there is nothing superfluous in nature, all of flesh and lifeless is in a cognation and influences on each other. People always intuitional felt these family connections and, being the most vulnerable creatures on a planet (in fact not a single living creature is subject to such amount of diseases, as we), sought a help and support at living and lifeless nature. Sought a help and at minerals. And, imagine, found. Eliafas Levi asserted that stone and man had mystic affinity. To strengthen this affinity, he suggested to "breathe ether through a stone". For this purpose it is needed to lay a stone on a palm and contemplate, presenting that he is obvolute invisible ether. To infuse into this ether in an own body, to detain on a few seconds and pour in back in a stone. Thus, in opinion of Levi, there is an exchange by information between a mineral and man. A stone begins to understand the proprietor, his needs, alarm, desires and expectations. A man can through such manipulations not only become more perfect spiritually but also cured from some diseases or facilitate their flow. Sit down straight, in a left arm to take a stone, close eyes and mentally to present the biofield of stone. Think that the aura of stone is wonderful, inimitable, refined. If after a while you will feel pricking in a hand a stone a pinch-off in which, he means heard you and ready to the dialog. But does not hurry to begin to speak with him. Stone are sluggish and sound. They need time in an order to decide, serve the proprietor or it is not. When a mental contact with a stone will arise up at once, it is possible to proceed to the next stage. Do exercise 1. To lie down on the back. Weakened and lay a stone on the area of heart. Mentally to imagine a semiprecious stone and retain appearance to completion of exercise. To remember the happiest moment of the life and endeavour to wake up senses which you tested then. Exercise must last 5-7 minutes. As a rule, a stone adopts the emotions of people through 2-5 sessions. If, taking a stone in a hand, you will feel that sense which was demonstrated him unexpectedly, it is possible to proceed to the third exercise. Do previous exercises consistently. To move a stone from an area a heart on a forehead, in the place of the so-called "third eye". It is now needed to be fully weakened and begin to take signals over a stone. If gold, lilac or rose radiance will appear your mental look, it is possible to consider that tuning of stone took a place on your biofield. If for time of implementation of this exercise you will test the unpleasant feelings, it is necessary immediately to halt a session. The scientific articles and materials of scientific author K.305 Yuliya V. Kaphtanova (Kharkov, Ukraine, CIS) can be officially ordered in the Kharkov Universal Scientific Library to address: a Cooperative street, 13, Kharkov, UA-61003, Ukraine (author's code K.305 2009-2015, Kharkov, Ukraine, CIS, passport of citizen official statement of the Ukraine MM670618, borned on September, 18, 1970 and constantly without break lives in town Kharkov, Ukraine, in 1994 are graduated the Kharkov National University, diploma KZ N 002101, department of mathematical physics of the applied separation of applied mathematics, mathematical physics faculty from 1987 to 1994, Ukraine, Kharkov, certificate of Р N 586275 about completion of school #9 Kharkov from 1977 to 1987 - to married life Yuliya V. Kanunikova to November, 22, 2000, Dzerzhinskiy region of the Kharkov). I love a classic electric music (photo & read detal).